Been busy the last few days, so I have not been working on this game during that time. However now I have gotten a few things done, so it’s time for another update. 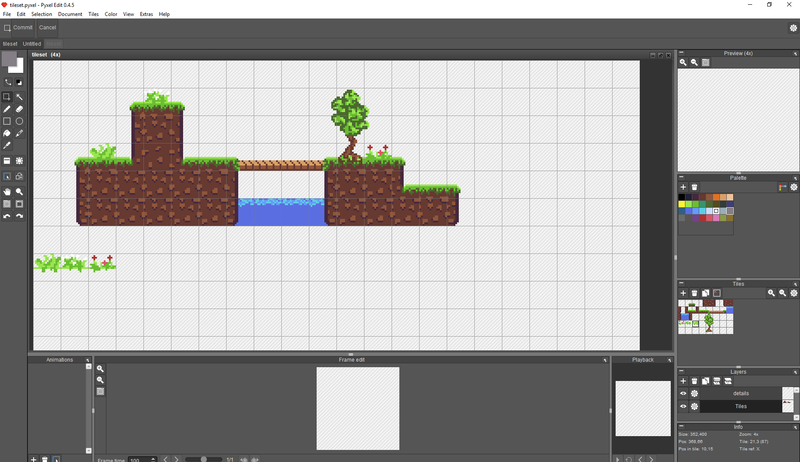 First and foremost, I have updated my tileset a little bit with a few new tiles to support the level I have designed. I also did a recolor of my one and only enemy, that I use for the underground passage in the level I have designed (the one and only level I will actually ship in this game). I have had a really hard time getting my level designed, it is really hard to design good levels. 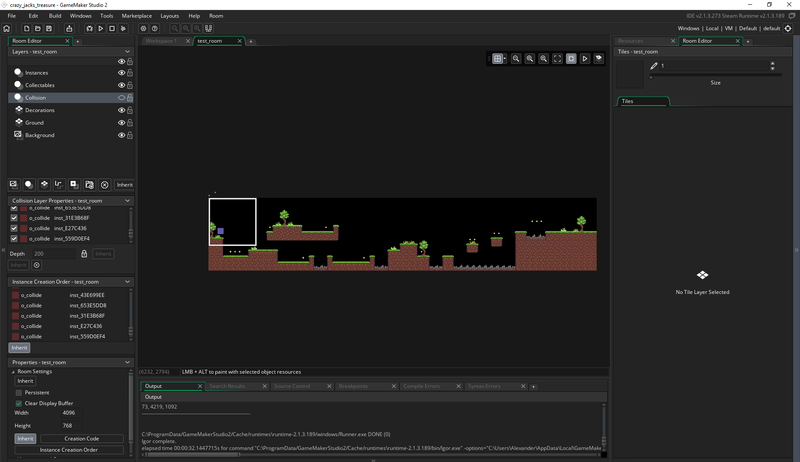 My intention with this level is to reflect the core mechanics, which in this case includes for instance double-jumps. The level basically has 2 alternative endings, you either venture on the grass or go under the ground. Whichever way you take, there are a few hidden coins in the level. Some are clever, and others are just really hidden. There are a few things missing from this level, I want to have a sign that has “GOAL” written on it at the end of the level, and I might actually get this done later. The other things I would have wanted, but not gonna bother with is to have torches underground that lits up the environment around it (with shaders). Which although would be nice, is not something that I think I’m gonna get around to doing. I have also made another small improvement. When you collect a coin, it will no longer just vanish. Instead, it will kind of animate itself upwards a bit before vanishing. The gameplay has also been improved. The player can now get a kind of “speedup buff” that lasts for 0.40 seconds(might change), with a cooldown of about 1.4 seconds right now. To use this speedup, you just use the direction keys. If you didn’t change direction(eg you pressed right when already going right) you get a temporary speedup. This makes it a bit more interesting for those that have got the level nailed down. You can use speedup to gain an advantage in the score, the score is not only based on how many coins you collect but also on other things such as how fast you complete the level. There may be some other small things I have neglected to mention, but other then that, this is what I have been doing. I have gotten around to do another small update, Highscore! 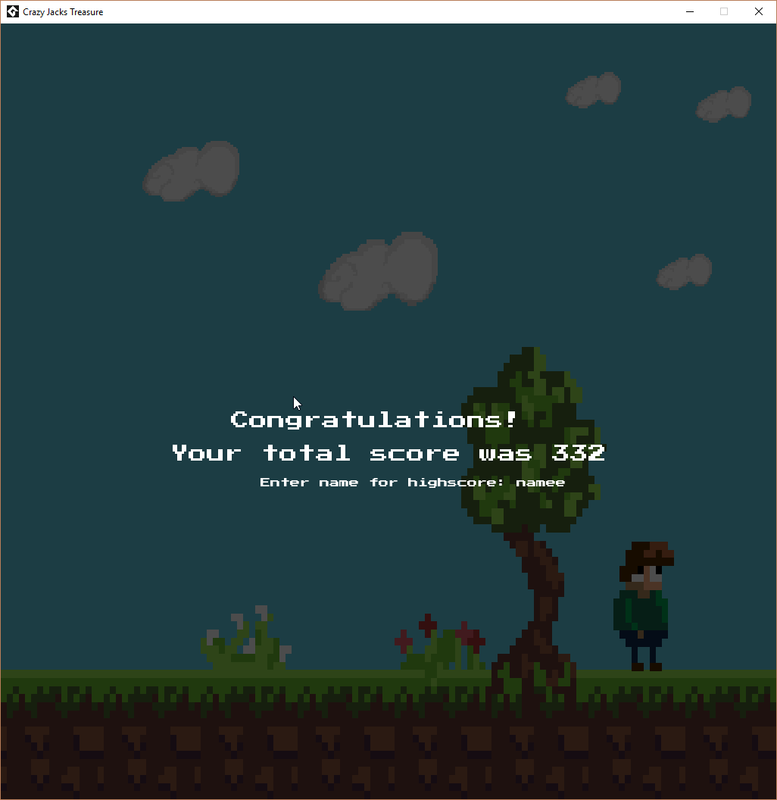 For the highscore screen I capture the last frame of the game, and have it as a background with an alpha of 0.2. 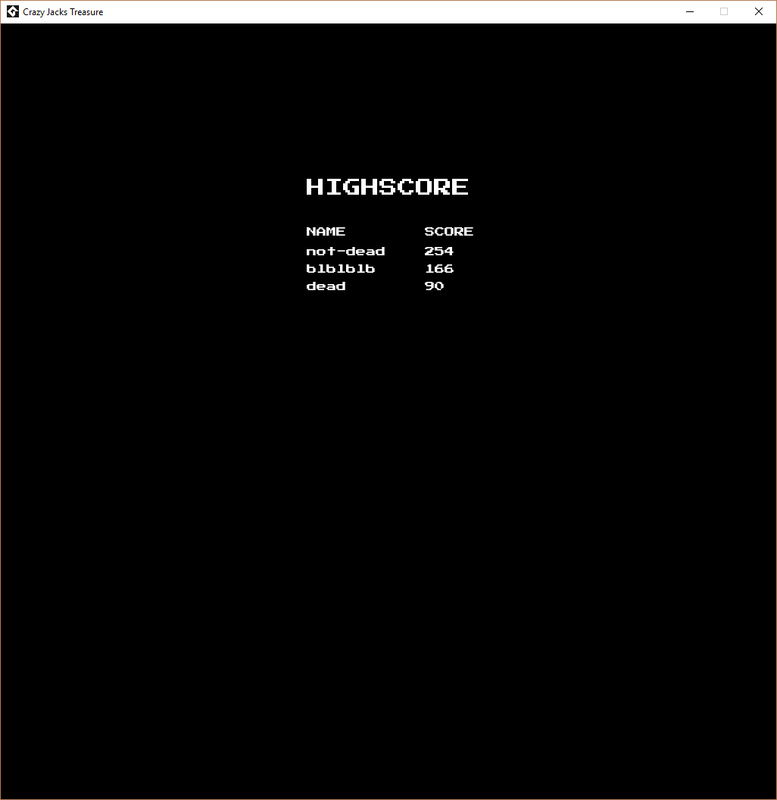 The highscore screen itself however, I kept even more simple, I will probably update it later on to include a background and a back button and mayby some other things. 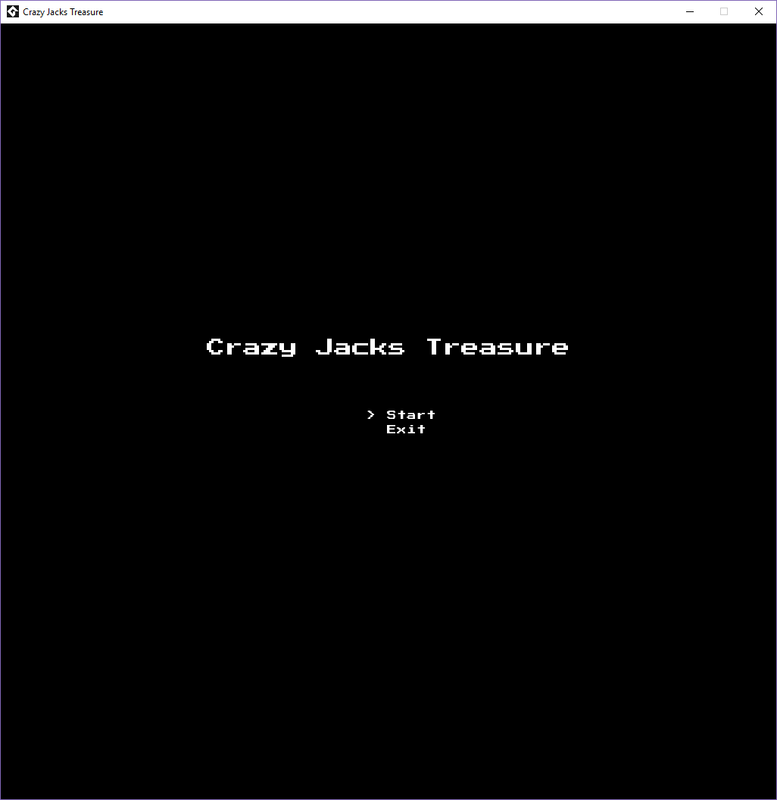 Tonight I started implementing the main menu for Crazy Jacks Treasure. The first iteration was just working, but really dull. So I started iterating on it by first adding a background image. And it just wasn’t good enough, so I added a little bit of content from the game. Some ground, a tree, and Jack himself (just an image, no animation). Then I decided to add an idle animation to Jack. It was a whole lot better now, however, I still wasn’t satisfied. So I added two states to him, one walk state and one idle state. He then changes states once in a while and walks around on the screen. This morning I had a chance to do a little work Jack himself. I have put off doing his sprite for a little while now. But I finally got him done, he has some crude animations as well which is kinda nice. The fly/fall animations (well its just 1 frame :P), is something I would have hoped to do better, but I left it as is and may improve upon it after the game jam. Day 2 is about done, so time for an update. I have written about it extensively on my Tumblr blog so I'll only recap shortly here and for those of you that are interested you can read the whole story there. There are a few more minor things done, but as said everything is covered on my Tumblr blog. I'll keep an eye out for this game, seems interesting. Like the idea of temporary stat increase after reading books. However for two weeks and without using an engine it is alot of work with little time. I agree with the rest, I am real excited to see where this is going! What is "Crazy Jacks Treasure"? help him collect it and get him home safely. Crazy Jacks Treasure is a small platform game, where you are to help Jack get his treasure back (in the form of gold coins). Jack is so devastated of the lost treasures, that he can’t stop moving, so the way to help him is to give him a nudge in the right direction, as well as jump to avoid hazards and collect his treasures. This game is made for the @myfirstgamejam. This is the first game I do, and also the first game jam I attend. So I wanted to make a simple game that didn’t require many assets nor much time to complete. 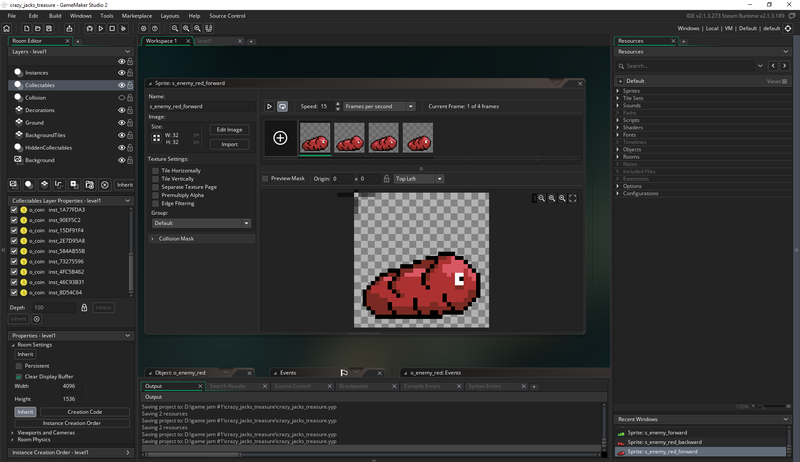 Everything I use in this game will be made by only me, will use no pre-existing assets. As I’m no artist, it will result in low-quality sprites and tilesets I’m afraid. The goals I had set for myself today was pretty relaxed. 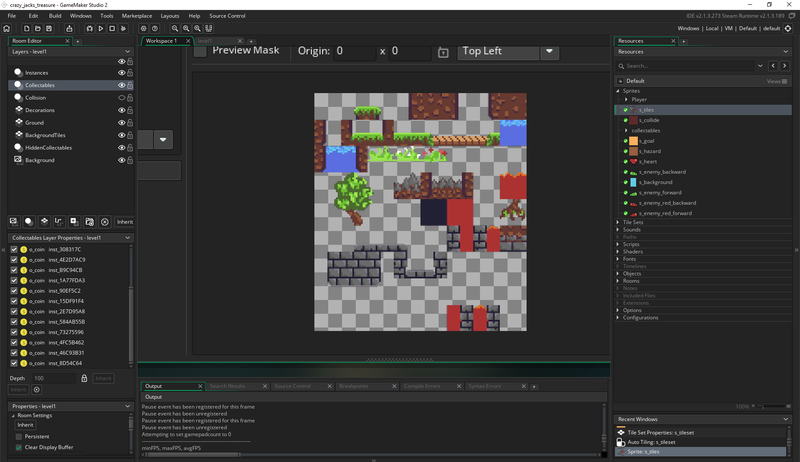 My plan was to start with a basic tileset, as well as a coin sprite. My time is limited, so I work on this a few times a day in small time frames. The other task I got done was my coin sprite, which is made with aseprite. I wanted a simple sprite, yet I wanted it animated as a hint to players that you can interact with it. 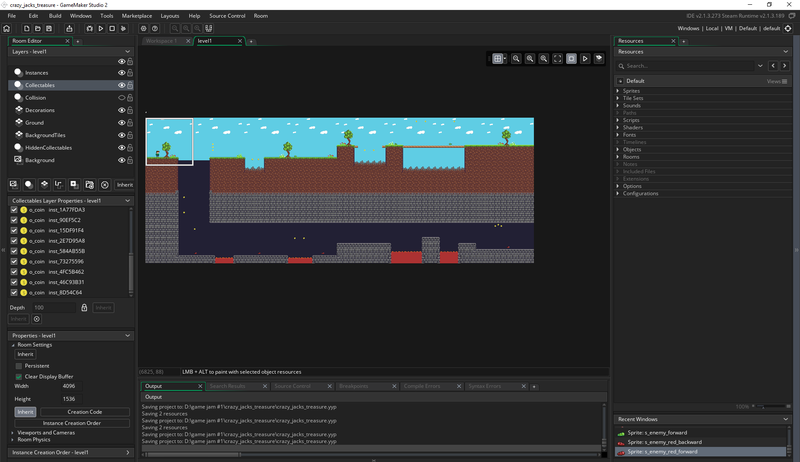 PS: Devlog can also be read at knasig.tumblr.com.